Acting Israeli prime minister Ehud Olmert said he's willing to make painful concessions and give up land to Palestinians as he claimed victory in the election Tuesday. This is a mind game that Israel has been fooling people with for so long. So many UN resolutions were made that Israel return to the 1967 borders for decades and only recently have they returned a tiny fraction of the required land and they are receiving praise for redefining the borders and cutting off Palestinians from their own homes by isolating settlements. "In the coming period, we will move to set the final borders of the state of Israel, a Jewish state with a Jewish majority," Olmert said. "We will try to achieve this in an agreement with the Palestinians." I think this is the problem, that Israel does not recognize Palestine and that they want to single handedly kick out all Arabs and non-Jews from the region. Unknown to most people, many Jews are living peacefully in Palestine and their land is not even being confiscated, unlike Muslims inside Israel who are treated like third class citizens at best. I hope for the best, but the past has shown that Israel will continue its policy of aggression and killings of civilians and continue to stand idle while Jewish settlers attack and deface Palestinians and their property while ensuring the violence continues so they will always have a reason to not continue the peace talks or at least to not work in good faith. His centrist Kadima party has captured the largest share of votes in Israel's parliamentary election with 29 to 32 seats, exit polls suggest. That would give Kadima – founded in November 2005 by Prime Minister Ariel Sharon – enough seats to head a coalition with two other centre-leftist parties, necessary to control the 120-seat parliament, or Knesset. In comments directed to Palestinian President Mahmoud Abbas, Olmert said, "We are ready to compromise, to give up parts of the beloved land of Israel...and evacuate, under great pain, Jews living there, in order to create the conditions that will enable you to fulfil your dream and live alongside us." 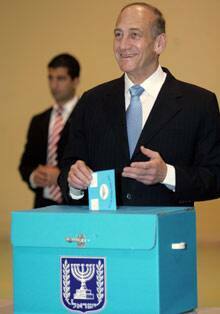 Olmert has said he will only govern with parties that accept his program. The centre-left Labour Party is in second place out of 31 parties with about 20 seats, according to the surveys released just after the polls closed at 10 p.m. local time (3 p.m. EST). The Pensioners' Party, another potential coalition partner, could win six to eight seats. The right-wing Likud party could capture about 12 seats, the polls suggest. Another party on the right, the Israel Beitenu Party, is also expected to win 12 to 14 seats, according to the polls, which were conducted by Israeli media. Their polls have been accurate indicators of final results in previous elections. Just 63.2 per cent of the country's five million eligible voters turned out, the lowest in any Israeli election. Voters do not directly choose one candidate, but instead choose from lists put forward by each party. The parties send members to the Knesset based on what percentage of the national vote they get. Near-final but unofficial results were expected by early Wednesday morning, while official results must be published within two weeks of the election. Olmert took over Kadima after Sharon suffered a stroke in January and went into a coma. The election has been called a referendum on Kadima's plan to withdraw from the West Bank. Olmert plans to dismantle dozens of small West Bank settlements while keeping larger settlement blocks, using Israel's security barrier to unilaterally create a new border between the two sides. But Likud Leader Benjamin Netanyahu says unilateral moves, including Israel's pullout from Gaza, have only rewarded terrorism. Labour Leader Amir Peretz has called for negotiations with the Palestinians and is also willing to give up Arab neighbourhoods of east Jerusalem in a peace deal. Few of the 31 parties contesting the election made peace a priority. Some analysts believe the recent win by Hamas in Palestinian elections has pushed aside talks of peace as an election issue, even among the more dovish parties. Security was tight as Israel deployed about 22,000 police and volunteers on election day. The Palestinian parliament on Tuesday approved the cabinet and plans proposed by Hamas, which won the recent Palestinian election. The militant group has not agreed to disarm or recognize Israel, as Western nations have demanded. Hamas said it would not accept Olmert's plans to draw new borders without consultations. A spokesman for Palestinian President Mahmoud Abbas did say the PLO would be willing to discuss the implementation of the U.S.-backed "road map" peace plan with the next Israeli government.